Remember middle school? For many of us, this often awkward period in life doesn’t always bring back the fondest memories. But not so for University of South Carolina alumna LeAnn Haga, despite moving to South Carolina and starting a new school in eighth grade. That “something” was a desire to teach, but it wasn’t until she was a senior in high school that she made a decision to study education. The goal of the Teacher Cadet program is to encourage high-achieving high school students, like Haga, to consider teaching as a career. Teacher cadets complete a dual-credit course which introduces them to the techniques of teaching as well as critical issues impacting education in America. The program is offered in about 170 South Carolina schools and more than 68,500 junior and seniors have participated in the program in its 32-year history. Haga was one of the nearly 40 percent of Teacher Cadets who choose to study education in college after completing the program. The UofSC College of Education partners with the statewide program and and offers campus experiences for students and instructional support. Middle school teacher, LeAnn Haga, benefited from three support programs including Teacher Cadets, Teaching Fellows and CarolinaTIP. That was certainly the case for Haga, who earned Teaching Fellow and Dean’s scholarships as well as a Palmetto Fellowship, and joined Pi Phi sorority where she served as the executive board member. Like the Teacher Cadet program, Teaching Fellows is funded by the Center for Educator Recruitment, Retention and Advancement. Teaching Fellows began in 1999 as a way to tackle the state’s growing teacher shortage, and UofSC Columbia is one of 11 Teaching Fellows institutions in the state. The Teaching Fellows program provides up to 200 education students with a $6,000 scholarship loan each year for up to four years at one of the participating institutions, and fellows repay the loans by teaching in a South Carolina public school following graduation for four years. Teaching Fellows participate in a variety of professional development and service opportunities in addition to the required standard education curriculum. Haga is about to finish her first year of teaching at E.L. Wright Middle School in Columbia. I’ve had such a unique experience, and I don’t think I would have gotten that at any other university. “I guess I went back to where I first fell in love with the idea of teaching — middle school. I’m teaching ELA (English Language Arts) to seventh-grade students. I love the content and the age of my students,” Haga says. And though Haga says she felt well prepared by the faculty at South Carolina, she says she’s relieved to have ongoing support from her alma mater through the new Carolina Teacher Induction Program, CarolinaTIP. “CarolinaTIP is certainly easing the transition from student to professional. It’s helped me professionally and emotionally,” Haga says. CarolinaTIP is a teacher retention program that provides recent education graduates with three years of support through group workshops and one-on-one mentoring from experienced coaches. About 65 education alumni are participating in the program, which began in fall 2017 in an effort to cut down the rising number of new teachers leaving the profession within the first five years. And, 100 percent of the teachers who participated in CarolinaTIP’s pilot year returned to the classroom. “At various times, new teachers just needed a cheerleader, a counselor or a confidant. Those first years can be overwhelming. Our coaches listen to their needs and adapted our program to meet those needs,” Skeen says. For Haga, the greatest need came in the form of behavior management after a few rowdy students started “wreaking havoc” in her class. Haga is already looking ahead to her second year of teaching and says she feels fortunate that UofSC has supported her on every step of her journey toward becoming a teacher — from career exploration in high school to career support as a young professional. “I’ve had such a unique experience, and I don’t think I would have gotten that at any other university,” Haga says. Generous gifts from our corporate partner, Colonial Life, allowed the College of Education to implement CarolinaTIP. To continue to grow the program and serve more teachers, we are asking for your support on April 10 during Give4Garnet, the university’s annual day of giving. 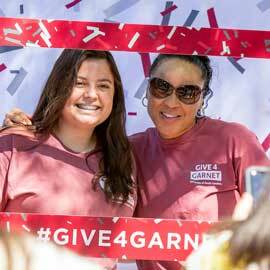 Another successful Give 4 Garnet finished with 6,576 donors making $4,028,875 in gifts during the University of South Carolina's second annual giving day.